About a year after this photo was taken, strong winds destroyed the sign. From my grandparent's photo album. 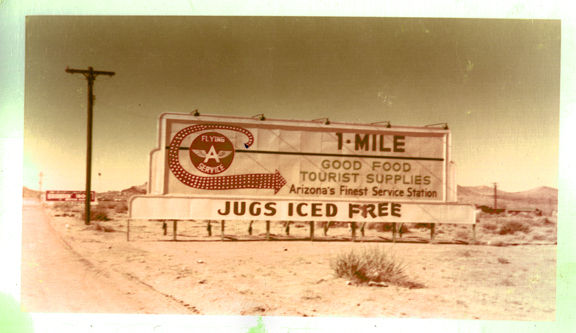 On the back it says, "Allen's station, Kingman, Arizona, 1958. Sign cost $150 a month in electricity to run. 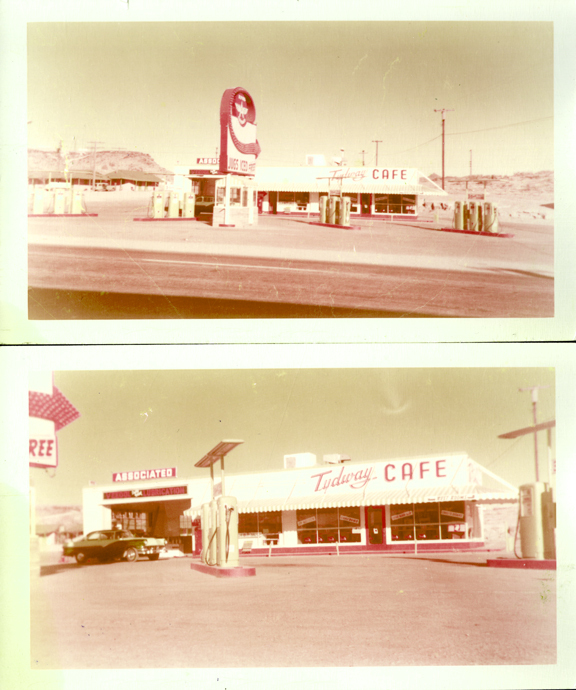 (200 bulbs on each side)" The '56 Ford belonged to my father as well, although he gave it to my mother to drive to work at the Arizona Highway Department. 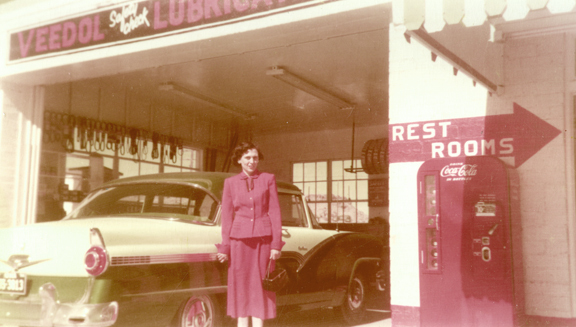 That's my mother, Bobbie, standing next to our 1956 Ford parked halfway in the lube-room. Check out the classic Coke machine. 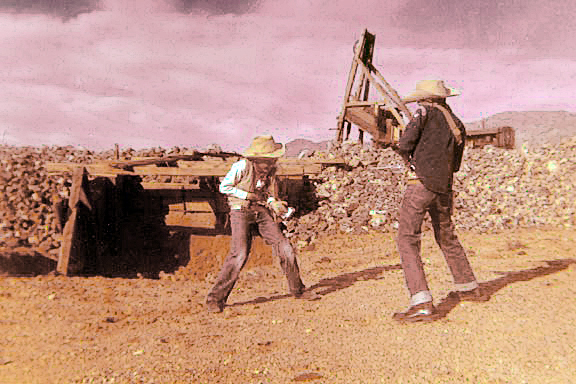 I was standing about where the front, right wheel is, when Cornel Wilde walked up to me, the next year, when Hollywood came to town to film "Edge of Eternity." They used my dad's Flying A in the movie and between one of the takes he stood next to me and said, "You're up kind of early." I said, "Yes." And that was my first conversation with a movie star. 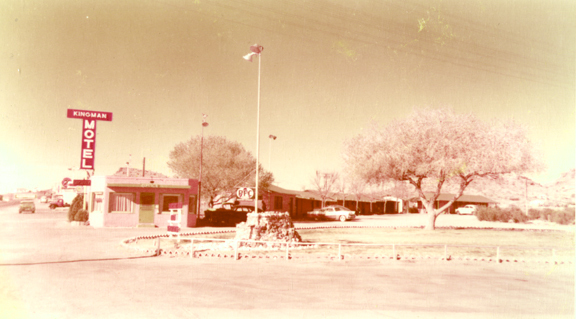 A rare view of the Kingman Motel, which was adjacent to my dad's gas station, to the west. Several years later, a Denny's restaurant went in here, about where the stone pile is. After church on Sunday, we liked to go out to one of the many ghost towns in Mohave County and have a picnic. I could invite a friend to go with us and on this Sunday I invited my friend Dan Harshberger and we were into playing "Guns" and we shot up the area with our Fanner Fifties. 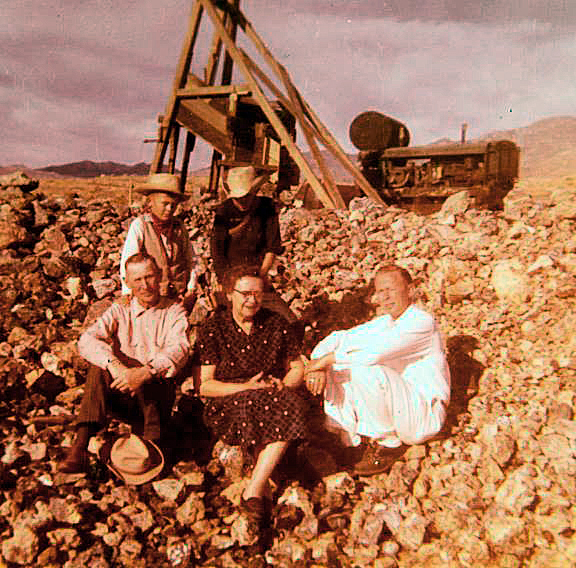 Here we are having a picnic in a mine tailing, recently worked. Note that my dad is still wearing his service station uniform. He probably worked half a day on Sunday and we picked him up to go on our picnic. "They were long and lean, and low and mean, back in '55 we were making Thunderbirds."